Weather patterns have changed a lot over the years. The weather has been extremely hot— sometime seriously hot. Most of us know the basic rules to beat the summer heat and how to stay cool and healthy during heat waves. Here are a few reminders of inexpensive ways to help you survive hot spells and make the days more bearable. During extremely hot days, the body losses more water than we realize from mostly breathing and sweating. When the temperatures climb, our eyes, skin, and mouth rely on water to maintain moisture levels. Be proactive about your water intake. Consider following the Institute of Medicine’s recommendation of consuming 91 ounces of water daily. Remember, you can obtain some of your water from certain fruits and vegetables, such as celery, watermelon or strawberries. You should avoid soda and, alcoholic drinks because these beverages hasten dehydration. Pay close attention to kids to ensure they receive proper hydration. Eat dinner outside during the twilight hours. Serve cooling foods, including sandwiches, chef salads served in chilled bowls, cooled slices of cucumbers and tomatoes, and fresh chunks of melons, recommends Frugal Luxuries’ Tracy McBride. Dark clothing absorbs light and heat. Dress in light-colored clothing and fabrics that breathe, such as cotton, linen, or silk, especially when outside during hot weather. Put some ice in a bowl or place a frozen block of ice in front of a fan. Try freezing the ice in a one-gallon plastic jug. The fan sends a blast of freezing air off the ice into the room. This solution also works in emergency situations for when you have a broken or malfunctioning air conditioning system. Close blinds or curtains on windows and doors, especially on the south and western elevations. Sunlight streaming through windows quickly raises the temperature in a room. Dark blinds and fabrics work best. Dark curtains keep heat out in the summer and cold air out in the winter. If the temperature drops below 70 degrees and you can get a nice breeze, you can save money by turning off the AC at night. You will have to close the windows early the next day and turn the air back to keep the home from heating back up and overworking the air conditioning. Every appliance, large or small, generates heat when running. Turn off and unplug all appliances that you are not using. 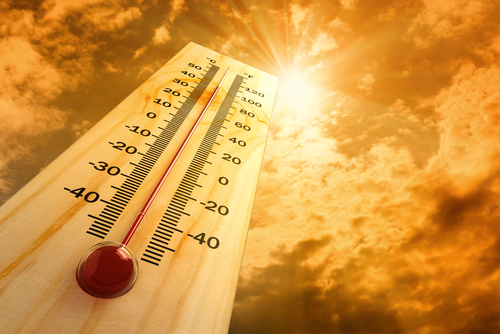 When it is hot outside, avoid using big appliances, such as an oven or clothes dryer. You can hang laundry out to dry or cook on the grill. You don’t have to strip down to your swim wear to try this one. Pull the pool under a tree and fill it with cold fresh water. Pull up a lawn chair, have a seat, and dip your feet and legs into the pool for a quick cool-down.